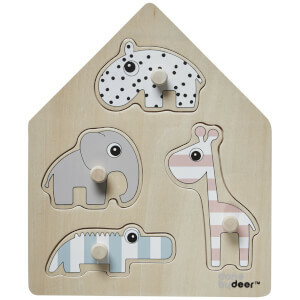 The Stick & Stay Plate from Danish design brand Done by Deer features the cute little character Elphee the Elephant to bring a smile to dinner times. The plate features two compartments and a deep rim with rounded edges that will keep food safely inside the plate and make scooping easier. When the plate is pressed down it will stay in place on a smooth surface. Natural suction will keep it firmly stuck down, preventing little ones from trying to tip, throw or push it. Perfect for babies and toddlers, the plate is crafted from child-friendly silicone.